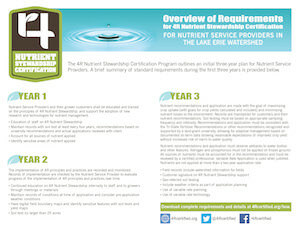 The 4R Nutrient Stewardship Certification Program outlines 41 criteria to be implemented, staggered over a three-year period. Each criterion will be re-evaluated each year by a private, third party auditor, via an in-person or desk audit, to maintain certification. Depending on the services provided by the Nutrient Service Provider, some criteria will not be applicable. Nutrient recommendations are consistent with the state’s land-grant university’s nutrient recommendations. A certified professional reviews the nutrient recommendations made for the grower customers. Nutrient Service Provider staff understand the 4Rs of Nutrient Stewardship. Soil tests, used to make nutrient recommendations, are less than 4 years old. Nutrient application equipment is calibrated annually. The timing of fertilizer application avoids spreading on frozen or snow-covered fields. Nutrients are not broadcast applied prior to a predicted heavy rainfall. All sources of fertilizer are accounted for in the nutrient recommendation. Phosphorus is applied below the soil surface whenever possible. Nutrient application setbacks are followed in sensitive areas.